Kamakiri (カマキリ) is one of the Shandian warriors that fought to take Upper Yard from Eneru. Kamakiri seems to be one of Wiper's most trusted fighters and is also good friends with Laki and Aisa, acting much kinder than the other warriors. He used a sickle and Burn Blade as a weapons. Kamakiri lost to Eneru in the Survival Game, but managed to live and warned Laki that Eneru was unbeatable and that she had to tell Wiper. He later recovers as the war ends. 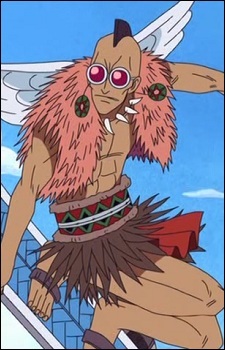 In a recent Japanese Fan Poll, Kamakiri is currently ranked the 45th most popular character in One Piece. Kamakiri (螳螂) is Japanese for Praying Mantis.